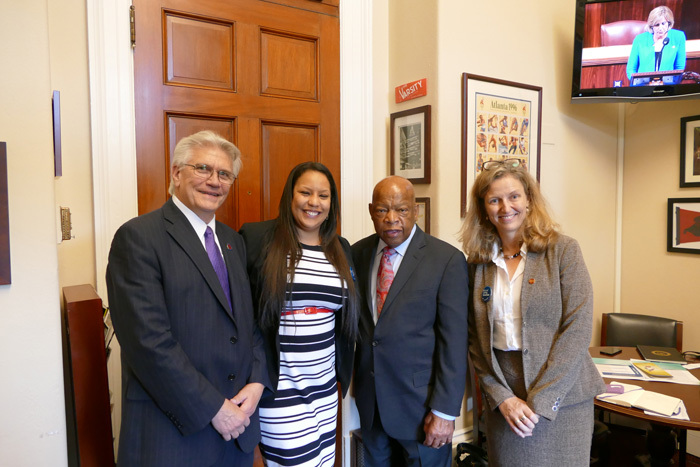 Early Career Advocacy Fellow Amanda Marie James meets with Representative John Lewis, accompanied by APS members Laura McCabe and J.R. Haywood. This post is part of the Early Career Scientist Policy Subcommittee’s series on science policy fellowships. The Early Career Advocacy Fellowship (ECAF) is a two-year program to engage early career scientists (ECS) in advocacy activities while they continue their academic work. All members of the American Physiological Society who live in the US and are within 10 years of receiving a PhD are eligible to apply. The application deadline for this cycle is November 16. 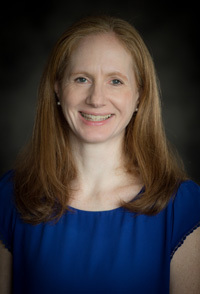 Rebecca Osthus, PhD, is the Associate Director for Government Relations and Science Policy at the American Physiological Society. 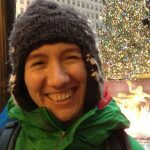 Rebecca oversees the fellowship program and told us about what the fellowship offers. What does the Early Career Advocacy Fellowship involve? The fellowship is a two-year term that fellows undertake while they continue their lab work, postdoctoral fellowship, or faculty position. Fellows work with the Society’s Science Policy Committee (SPC) members to develop their advocacy skills. For fellows who attend the Experimental Biology meeting, there is an orientation session where incoming fellows can interact with fellows from the previous year along with SPC members and APS staff. We go over basic advocacy information, but the process is mainly about having a conversation and giving fellows a chance to ask questions before they go to Capitol Hill. Fellows join the SPC and attend the annual meeting in the DC area, during which we ask them to schedule meetings with their members of Congress. We go with them, which allows them to have meetings with someone else in the room —helping them get over the initial hump that might seem daunting. They can be involved in the SPC as much as they wish, but they can also continue on their research path. In their own time, fellows also work on a policy or advocacy-related project of their choosing, with support from a member of staff or the SPC. What kind of topics does the SPC work on? Some of the issues the SPC is currently working on include looking at how peer review is done at the National Institutes of Health—whether this process is progressing smoothly or whether there are topics that the community wants to comment upon. Another topic is how to increase advocacy efforts for the National Science Foundation. We look at agency funding policies, specifically the policies that apply to researchers who secure funding. For example, NIH is changing the way they classify clinical trials so that research with human subjects will be classified as a clinical trial, which comes with a host of new regulations. We take a look at policies to give input on how to make them work well for basic researchers. What kind of projects have fellows worked on over the years? We purposefully keep the requirements for the project very informal so that fellows can follow their interests. Fellows have done a wide range of things, for example, written an article for the APS newsletter on a policy issue or given a seminar on advocacy at their home institution to share their skills and get more people involved. One person even came to DC and participated in an advocacy event for NSF to showcase her research and demonstrate to members of Congress and NSF leadership what kind of projects get funded and why their research is compelling. What have previous fellows gone on to do? Several have continued in their academic career and some have stayed in academia but added extra administrative responsibilities, such as tech transfer. Two fellows joined the SPC as regular members because they wanted to continue their advocacy activities. Others have left academia: one person became an AAAS Science and Technology Policy Fellow; one person joined a patent law firm, and we even have one fellow who joined the astronaut corps at NASA! Why did APS decide to fund these fellowships? Prior to establishing this fellowship, we engaged some of our members in advocacy through our two policy committees—one on funding policies and one on the humane use of animals for research—both committees engaged their members, but that was a limited pool of people. We had people come to us asking us for advocacy opportunities, but we had no formal mechanism in place. We decided to launch the Early Career Advocacy Fellowship for ECS to develop their skills and take those forward, hopefully through sharing their experiences with their institution and their future trainees. The fellowship is a way for our members to be involved in advocacy and for us to develop a larger pool of scientists who have the skillset to be involved in advocacy as part of their professional service. What do you look for in ECAF applications? The biggest thing that we look for is a clearly articulated interest in advocacy—have the applicants thought about what advocacy means and what issues they are interested in? The application letters are reviewed by members of the SPC, and they look for ideas of how prospective fellows will use these skills in their future careers. If somebody can articulate their interests, it speaks to their communication skills and their ability to communicate their thoughts to non-scientists. Most members of Congress and their staff don’t have that background and so we need fellows to be able to adjust and explain their research and its importance so that somebody else can understand it, even if they don’t have that same technical background. What do you hope fellows will take away from the program? One of the biggest things we hope they take away is that it isn’t as daunting as it might seem! It isn’t as scary as people think to call a member of Congress and arrange a meeting. Fellows will go through the experience with support from SPC and the APS staff, who will demystify the whole process. We also hope that fellows share their experience with others so that we can develop even more scientists with advocacy skills! Giovanna Collu is co-chair of the Early Career Scientist Policy Committee and a postdoctoral fellow at the Icahn School of Medicine at Mount Sinai. Giovanna’s goal is to increase advocacy opportunities for early career scientists with a focus on diversity and inclusion.